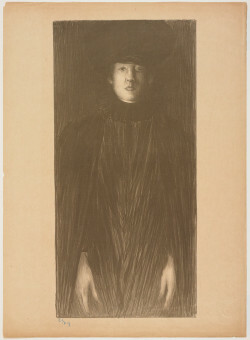 "l’Estampe Originale: A Celebrated Album of Original Printmaking 1893-1895"
Norbert Goeneutte, Femme vue de face (1894), lithograph printed in brown ink, image 53.18 x 25.24 cm, sheet 60.01 x 43.5 cm. Collection Minneapolis Institute of Arts. Gift of C.G. Boerner, 2011.58.2. In fact, many of the artists selected by the publisher André Marti are world renowned: Gauguin participated, as did Toulouse-Lautrec (twice), Camille Pissarro, Odilon Redon, Pierre Bonnard and Maurice Denis. But these illustrious names account for only a fraction of the 95 works Marti published between 1893 and 1895, and most museum-goers are already familiar with their work. The real value of the Minneapolis show lies not with such glorious outliers (most are absent from the show in any case), but in the portrait of a time and place that arises through the manifold efforts of lesser lights. 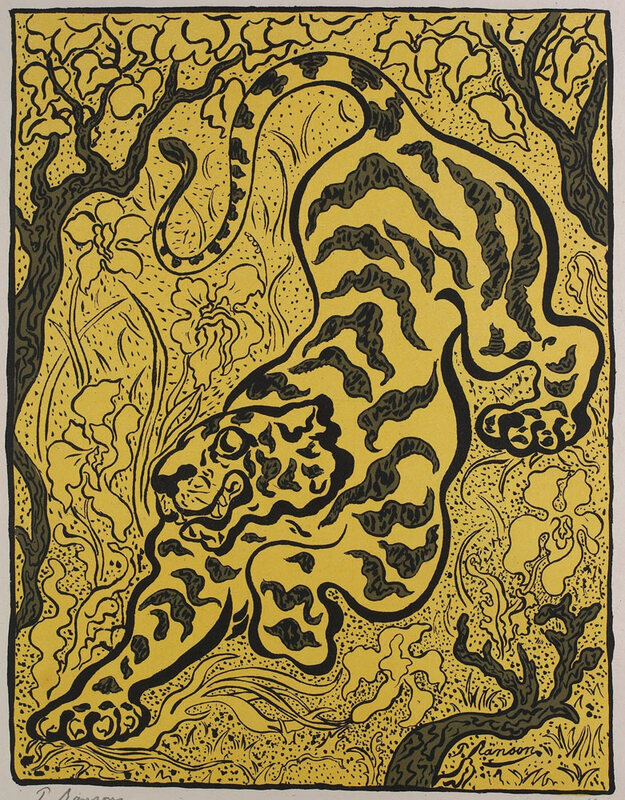 Paul Ranson, Tigre dans les jungles (Tiger in the Jungle) (1893), color lithograph, image 36.51 x 28.58 cm. Collection Minneapolis Institute of Arts. Gift of Mrs. Patrick Butler, by exchange. P.70.69. 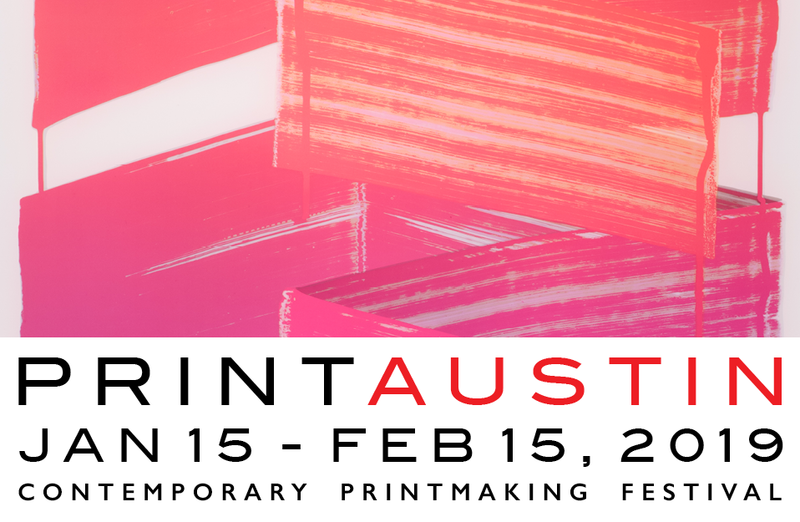 The show opens with Camille Martin’s cover lithograph in which two species of flowering vine wrap themselves ornamentally, if inexplicably, around a printing press. A few feet away hangs Jules Cheret’s wispily clad, effervescent nymph (christened “Cherette”) who floats up the page like a bubble in champagne. Ahead lies a bevy of sinuous, colorful, pleasant pictures. Some are airily delicate (Pierre Roche’s salamander and beetle); some are stolidly straightforward (Henri-Charles Guérard’s woodcut of two rabbits). Paris itself rarely appears, but Parisians do, or rather Parisiennes—a succession of mutton-chop sleeves, slim ankles and chars; the fashions are specific, the faces are not. All these works are charming, though at times it feels as if everyone had signed up for the same Japonisme class— a point brought home by the inclusion of both Henri Riviere’s Wave, a lithograph working hard at imitating an Ukiyo-e woodcut, and Henri-Gustave Jossot’s Wave, a joke in which a hapless artist (visible only by his boots) is about to be overturned by a Hiroshige-esque great wave. A fresh openness to technical experimentation can be seen in Pierre Roche’s sweet Algues marine (1893), a “gypsotype” printed from a sculpted plaster template, and the blindstamped cherry blossoms of Alexandre-Louis-Marie Charpentier. 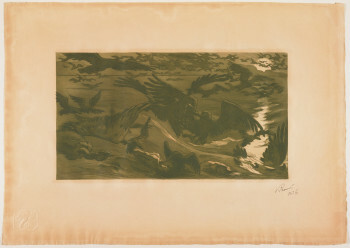 But even the rumble of foreboding sounded by Symbolism remains fundamentally decorative: Victor Prouvé’s Oiseaux de proie could be an etched preview of Hitchcock’s The Birds, and Georges de Feure’s La Source du Mal (1894) articulates the link between Symbolism and psychedelia more clearly than any academic paper could hope to do. Style is everything, and content—so long the industrious schoolmaster of art— has taken a long-deserved holiday. Such decadent disregard for higher moral values was, of course, a serious avant-garde statement in its own right. Thirty years after the Impressionists had replaced Roman heroes with music halls and city parks, an art entrepreneur like Marti could delight in the new confusion between art, design and commercial shilling. Victor Emile Prouvé, Oiseaux de proie (Birds of Prey), etching and aquatint in olive green ink, image 23.97 x 42.23 cm. Collection Minneapolis Institute of Arts. Gift of Mr. and Mrs. Edward A. Foster, 1956. P13,402. The Realist social agenda of earlier decades is present in the laundresses, street pavers, errand girls and peasants of Auguste-Louis Lepere, Henri-Gabriel Ibels, Richard Rauft and Paul Sérusier. The latter, a member of the Nabis and a pioneer of abstraction, also represents the whiff of future change that hangs in the air of this exhibition—a hint that the formal innovations borrowed from Japan two decades earlier were about to break open into a new world in which gesture and color would finally divorce themselves entirely from frogs and vines and pretty girls. The role of print in that epochal transformation is suggested in a handful of works. Norbert Goeneutte’s lithograph Femme vue de face (1894) is shown against the artist’s working drawing of the image, demonstrating how lithography pushed a competent, if static, drawing into something harder, starker, more rigid— like a Munch shipped off to military school. Redon’s — hovers on the very edge of legibility, its focal point an inexplicable sphere. 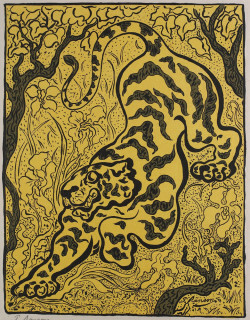 Finally, Paul Ranson’s Tigre dans les jungles (1893) could have been made at any time in the last 120 years, equal parts Paul Gauguin, Raoul Dufy, Zap Comix. A hundred years before Ranson, William Blake’s Tyger Tyger Burning Bright was meant to be terrifying, but looked like a large and mournful dog. Ranson’s tiger has all the panache and managed menace of a Cancan dancer. Languid, smug and beautiful, it turns terror into a delightful decorative distraction.